iPhone HD set for radical design change? Wouldn't you know it - Spring lands and suddenly everyone is going iPhone-rumour crazy, and this time we've got a humdinger. 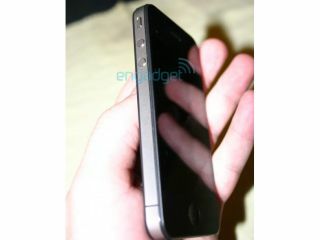 The iPhone HD/ iPhone 4G has apparently been snapped not once, but twice in leaks that either show Apple is losing interest in secrecy or someone's playing games with Photoshop again. While we're loathe to simply put up every picture in the world of rumoured leaks of the next iPhone, this one has been 'found on the floor of a San Jose bar in an iPhone 3G case', according to Engadget. It's a very different design (which instantly raises the alarms to us) with a chunkier look and a less sleek chassis - although we have been expecting something a little different from Apple with the fourth iteration of the iPhone. But here's the kicker: Engadget has dug out a picture of an iPad prototype with a device that looks very similar in the corner - it might be blurry but there are definite similarities. And the design shown off by this bar-room treasure hunter mimics the one posted on Twitter back in February exactly - check it out if you don't believe us. We'd be surprised if this was the eventual shape of the next gen iPhone - it doesn't have the sleek look that Apple is still in love with (shown by the iPad design). Add to that people saying that this phone is on sale in Japan as an iPhone knock-off, and has been for months, and we're starting to doubt it very much. But we all like new pictures to look at on a Monday morning, right?